Supercharge your sourcing, get more placements. Send personalized e-mails with follow-ups in 5 seconds directly from LinkedIn, your ATS, or anywhere. Source effectively, eliminate data entry, and track all outreach. 10-day free trial. I was initially hesitant to switch my workflow, but Trinsly's focus on personalization has become my competitive advantage to cut through the noise of impersonal sales messages. Trinsly streamlines my process and allows me to send personalized e-mails directly from LinkedIn. With a profile in front of me, I'm able to personalize my outreach and not only improve my e-mail outreach speed, but also increase the quality of each outreach so that I can best connect with prospective clients. Trinsly has changed my recruiting approach and has allowed me to increase the number of people I reach out to. I've become a more detailed-oriented recruiter with the customizable automated follow-ups. It's so user-friendly and easy to navigate and integrates so well with LinkedIn. Trinsly keeps everything in one place and takes the repetitive manual steps of sourcing and automates them. The customization I can make to each e-mail has improved my response rates drastically and the tracking and stats are very helpful. Best of all, I never have to switch tabs when sourcing again. You need to follow-up. Following up three times in two weeks doubles your response rate. Trinsly takes care of follow-ups and automatically stops them when we detect a reply. Are you sure you or your colleague didn't reach out to this person? Trinsly stores all your teams' reach outs in one place. No more wasting hours a week with data entry into an ATS. 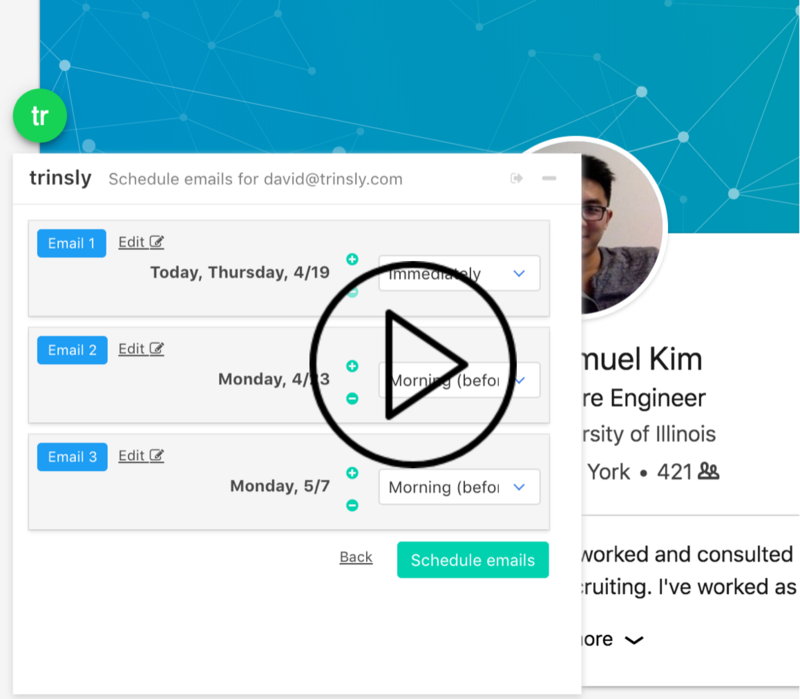 No more cutting excel spreadsheets, copying & pasting messages, or setting reminders. Stay on one tab and reach out to more candidates in less time. You need to track your response rate, email open rates, and link open rates. Trinsly tracks it all for you and makes it easy to A/B test so you can know what's working. We integrate with Google Apps, Office365, and IMAP/SMTP and your ATS (Greenhouse, iCims, Bullhorn, etc). All e-mails go out from your sent folder and all replies go directly into your inbox. *Trinsly is for talented recruiters who already know how to build connections with engineers and match candidates to the right job and wish they had two more hours a day to just source. Schedule a demo with us and we’ll show you how to save time sourcing while engaging with more prospects so you can fill roles faster. Modernize your recruiting outreach today.